There are many ways of trying to understand the world around us, our place in it and how we are connected to it. I think it's arrogant to assume that any one model of the universe has to be right, whether set out from the perspective of science, religion or mysticism. Perhaps the truth lies in several of them, each containing fragments of an overall truth. This book, written by alternative therapist Synthia Andrews, sets out our human place within a world of interconnected energy, and contains more than a hint of mind over matter. Andrews presents the reader with a self-help guide full of meditation techniques and philosophy. It is a synthesis (her name is compellingly apt!) of psychology, Hindu/Buddhist religion and Alternative/New Age philosophy. Many years ago, when I was a student, I read the complete works of Carlos Casteneda. As music can shift your mood, his writing shifted my consciousness to a different level. Andrews is not Casteneda, it has to be said, but she has pulled out some of the psychic, transformative imagery from his books and built a system of self-awareness development around it. That imagery pertains to the fibres of energy emanating from the midriff of a persons body that allegedly provides connectivity with life-forms and/or spirits in the greater environment. This trans-dimensional vision is connected to the Eastern understanding of Chakras, suggests Andrews. Through spiritual development of these energetic centres in the body, the powerful Kundalini energy can be carefully coaxed into activating, thus transforming human experience. Her prescribed methodology is provided in the form of 13 meditations (The Winged Disk above is one), described at the beginning of the book. Self-awareness is a key to her spirit-based system. The reader is invited to develop a second sight - to see into the spiritual dimensions around us, like someone leafing through a Magic Eye book shifts their vision to see a hitherto invisible image. As with other books of the genre, my role as book reviewer does not extend to testing the meditation practices. Such an approach is beyond the remit of this review. But practitioners of meditation will surely find new insights and original methods within Andrews' work. The next section of the book is more theory-based, covering extensive ground concisely. What struck me was her interest in understanding the inter-connectivity of humans and the Earth - the so-called morphic resonance. She sets out a complex energetic framework for individual people, and then goes on to extrapolate to a similar system for the Earth herself. If man is a reflection of the Cosmos, then this makes some sense. It raises questions. Can we save Gaia through our intercessions on a spiritual level? Are coming Earth-changes going to transform human consciousness through some kind of paradigm shift? Can mastery over our spirituality allow us to bend matter to our will and, if so, to what extent? Science is dabbled with here - not always convincingly. Energy and matter are inter-related, it is true. But on a scientific level the practical significance of that relationship is found in the interior of stars and atomic bombs, not chakras. But many authors have caught onto the strange new world of quantum physics, with its bizarre implications for the 'real' world. M-theory and string theory provide an inter-dimensional possibility that allies itself to some degree with mysticism and human spiritual experience. Where this certainly creates much potential for misunderstanding, it cannot be ruled out that our Western mindset is limited to the inside of a confined box, beyond which are wonders. Andrews seeks to step outside the empirical box, and guide others through that self-same barrier to spiritual growth. The last section of the book is a more comprehensive look at the journey itself. As any good teacher would, she develops her theoretical themes into the more pragmatic sphere of human social experience. There is much psychology to be found here, re-framed within Andrews' system of reference. Moving on from our individual struggles to develop spirituality in the context of the real world, she offers thoughts on the advantages of group work. Can intention (more Casteneda!) be amplified - via the focus of many practitioners meditating together - to facilitate distance healing, for instance? One can see here how the new language of the New Age is used to re-define the age-old practice of religious prayer in a place of worship. 'The Path of Energy' has clearly been painstakingly worked upon, and crafted. I don't think I found a single typo. There are many excellent drawings, and the text is set out well. It ticks a great many boxes, and I'm sure that the author's famous husband is rightly impressed by her contribution to the field, as well as her clear, serious prose. It is certainly a book I can recommend to an open-minded person interested in pursuing a New Age spiritual path. Although impressed by the book, I was not personally inspired by it. But then I didn't meditate, or otherwise practise the many exercises described therein. And surely that's where the inspiration really lies. 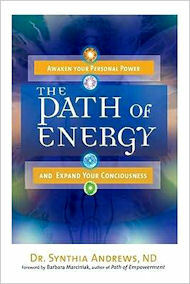 Subtitled "Awaken your Personal Power and Expand your Consciousness"